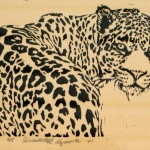 This entry was posted in linoleum block prints, wildlife art, wildlife merchandise and tagged hand-printed, leopard, linoleum block print, print, rice paper, tote bag, wildlife on March 13, 2019 by Bernadette. 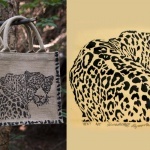 This entry was posted in animal-inspired merchandise, linoleum block prints, wildlife art, wildlife merchandise and tagged hand-printed, leopard, linoleum block print, tote bag, wildlife on November 4, 2017 by Bernadette. 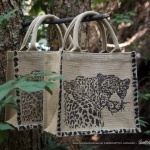 This entry was posted in wildlife art, wildlife merchandise and tagged leopard, Small Jute Tote Bag, small tote bag, wildlife linoleum block print, wildlife tote bag on June 22, 2017 by Bernadette.